This is the last installment of birthday photos. There are way too many to go through, and it already seems like a long time since the party actually happened. All the balloons are deflated, all the leftovers are eaten, and all the toys have been played with. We are looking forward to the second year of the boys life and the fun that will come. This was the adult cake for their birthday from Bruster's. A chocolate chip ice cream cake that was a lot larger than we thought it would be. Big Papa holding Wyatt while everyone played outside. Wyatt still hasn't gotten used to the feel of grass on his toes. 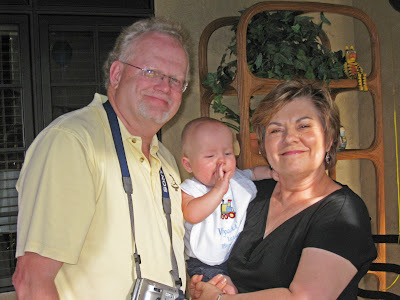 Randi's parents holding Wyatt just before he dove into his smash cake. 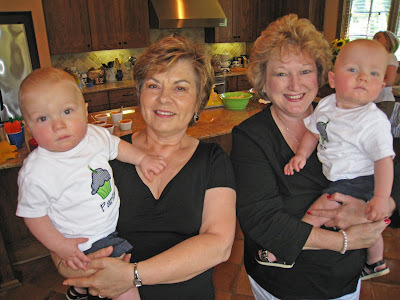 The boys' grandmothers holding them before the festivities got kicked off. There seems to be a lot of holding going on in these pictures. 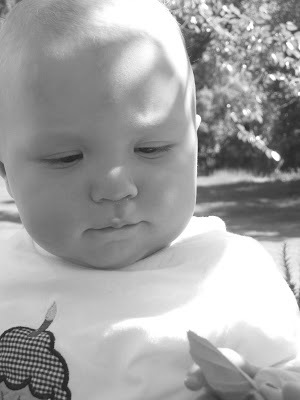 Parks examining a leaf. He was probably also getting held at the time. I think that he is going to be our baby that wants to be outside all the time.